Four Comox Valley women take the lead as Rotary Club presidents during a pivotal year in the organization’s history. as though the wood might energetically relay a message to him or tell a story. He has hand-picked every single piece of cedar in his shop. During the selection process at local suppliers he looks for the best old growth lumber harvested from Vancouver Island. He has an artistic eye for fine details, matching colors and wood grain patterns, while imagining whether the individual piece of wood is destined to become part of a chair or a table… or something else. Bloomfield developed an interest in woodworking when he was a boy growing up in rural Manitoba. His first introduction to the craft was at a church at the age of six. 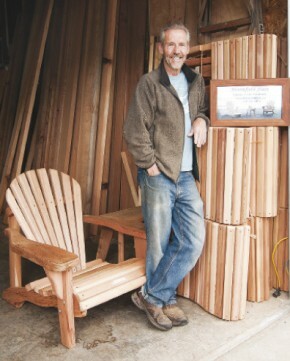 Decades later, Brian Bloomfield is now the wood craftsman/designer/manufacturer/owner behind a successful Vancouver Island enterprise called Bloomfield Flats Custom Cedar Furniture. His wife, Judy, “does everything else”—including managing orders and keeping the books from their home-based office just south of Courtenay. While they are a company of only two, the Bloomfields have built a solid reputation for excellence in custom-crafted cedar furniture. Their furniture has been sold to hundreds of customers on Vancouver Island and the mainland, as well as clients across Canada, the United States and into Europe. People recognize a superior product when they see it and appreciate the beauty and durability of Western Red Cedar. Brian Bloomfield moved from Manitoba to Vancouver in 1979, where he continued what would turn out to be a 35-year career in the aircraft industry. He also worked hard to build a life on Vancouver Island. From 1981 through 1989, he commuted from the Comox Valley to his Richmond-based job—often by motorcycle—every weekend. The chair that would change the course of the Bloomfield’s lives appeared soon after they met. Judy came home one day with a couple of rickety old wooden chairs that she had purchased for $5 each at a garage sale. She had no idea these ‘treasures’ would be the start of a new enterprise built around her husband’s hobby. ‘That chair’ was a welcome addition to the couple’s yard. It was so comfortable that friends and family fought over who would get to sit in it. Soon, he had to make more for the yard—and for others. The orders started coming in. Lorna Bridge of Country Catering and Brian Walker of Walker Small Engine Repair placed the first ‘official order’ of six chairs. They still own and enjoy them 28 years later. The Bloomfields soon realized that they had found a market niche. They decided that Brian would officially make chairs as a sideline business and attend a couple of events per year to showcase his products. This would give some focus to the furniture enterprise without cutting into other work commitments and family time too much. They needed time to work on the hobby farm and to enjoy the cabin they had built on Maurelle Island. In the mid 1980s, the general public got their first view of what was then sold as ‘BNB Cedar Furniture’—short for Brian N. Bloomfield. They displayed their wares at the Comox Valley Farmers’ Market and the Filberg Festival. In 1986, the Bloomfields purchased a 20-acre parcel of raw land from Comox Valley environmental crusader Ruth Masters. The farmstead became known as Bloomfield Flats when a family friend made up the name, crafted a wooden sign, and hung it on the entrance gate. The name stuck. Years later, the Bloomfields fulfilled the environmental stewardship pledge they had made to Masters when they purchased the property. They registered the first legal covenant in the British Columbia Agricultural Land Research (ALR)—a designation that ensures the land will remain undeveloped in perpetuity. Inspired, in part, by Masters’ commitment to environmental stewardship, Brian became a dedicated social and environmental crusader, too. In addition to many volunteer commitments over the past 25 years, he is the outgoing president of the Millard-Piercy Watershed Stewards, a local non-profit organization with a mission to maintain and restore the watershed. The Bloomfields would enjoy life at Bloomfield Flats until 2006, when they decided to sell the farm and downsize. Fond memories and many friends had been made during 20 years of community gatherings and potluck dinners held at the acreage. The chicken wire backstop and ball diamond that Brian had built in the corner of the hay field had become an integral part of almost every gathering and had provided seemingly endless hours of fun and laughter. But it was time to move. Considering that they loved living in the rural triangle between Courtenay, Royston and Cumberland, they purchased an existing home with a view of the bay, just down the road from Bloomfield Flats. In January 2010, with the help of Community Futures Strathcona, Bloomfield Flats Custom Cedar Furniture became a fulltime business. Weekdays you will find Brian busy building furniture in his workshop. Weekends (and some evenings) he, Judy, and their Australian Cattle Dog, Winnie, take a trailer packed with furniture and hit the road. The product is displayed at venues throughout Vancouver Island. Over the years, Brian had continued to tweak the design of the Cape Cod/Adirondack or Eastcoast-style chair he had started with until he was 100 per cent satisfied with the finished product. Now, with more time on his hands for research and development, plus a number of customer requests for a chair that was easier to get in and out of, he designed his own style of seating that he labeled the ‘Westcoast’ chair. It was officially launched in January 2010. Brian guides me through his workshop, which is piled high with cedar furniture in various states of assembly. He points to one of his custom-crafted Westcoast chairs. “Please be seated,” he says with a smile. I settle down into the chair and am amazed how comfortable it is. Without a doubt, “sitting is believing!” The only thing that could improve the experience is a cold beer and an ocean view! I get a flashback to when I was pregnant more than 20 years ago. I had made the mistake of settling down in a low-slung Eastcoast-style chair at a friend’s house. It took a Herculean effort on my part to exit that chair without the assistance of a crane! I remind Brian that a wide variety of people will appreciate the ‘ease of exit’ feature of the Westcoast chair, not just Baby Boomers. While the custom-crafted range of chairs built to accommodate most sizes of individuals remain a customer favorite, Brian also makes loveseats, combination table/chair models, plus a variety of tables, barstools, footstools, garden trugs, and other custom-built items upon request. For example, he crafted the beautiful 12-foot long cedar banquet table in the lower level of the Old House Restaurant. Brian agrees. “As we celebrate our 30 years of success this summer, Judy and I extend our sincere thanks to the people of the Comox Valley and beyond for supporting our business,” he says. For more information visit www.bloomfieldflats.ca. Brian Bloomfield stands in his woodworking shop and surveys an assortment of cedar boards that are neatly laid out against a wall. The rough-hewn Western Red Cedar is standing vertically—like a dense forest of trees. Bloomfield examines each one carefully, sometimes reaching out to touch this one or that, as though the wood might energetically relay a message to him or tell a story. Naomi Carmichael, Deb Nolan, Holly Grant and Lynn Brandon are dressed in black waistcoats and top hats, circa 1905. Fake moustaches and beards are haphazardly pasted on the women’s faces and they are trying valiantly not to laugh. It is a sunny evening in late June, 2011. A crowd of more than 100 Courtenay Rotary Club members and guests are in attendance at their Annual Installation Dinner at the Westerly Hotel. They roar with laughter as the women in black do their best to stage a reenactment of the very first Rotary Club meeting that was held in Chicago 106 years ago. One by one, the ‘actors’ rise from their chairs and pretend to gaze into a ‘crystal ball’ in the middle of their table. They ‘smoke’ fake cigars and make off-the-cuff comments as they pretend to foresee the future of Rotary—one that did not include women members amongst their ranks. The Courtenay Rotary Club was gathered for the installation ceremony of its 2011/2012 executive, directors and officers, and to celebrate the start of its 75th year. The comical skit served two purposes: it is a traditional part of this club’s installation ceremony and was also a way to have some fun while celebrating a very important Rotary International (RI) historical milestone—the 25th anniversary of women in Rotary. They end their parody with a flourish, shedding their waistcoats to reveal black T-shirts emblazoned with the word ‘Rotary’ in sparkling rhinestones. They sing and dance in a not-so-perfectly choreographed chorus-line style to the strains of the song Now is the Time. The crowd gives a standing ovation and heartily applauds them for their efforts. This skit will be re-enacted three more times, at the installation ceremonies for the other three Comox Valley Rotary Clubs. And, despite the jovial nature of their performances, these four women know that their roles as presidents of their respective clubs carry tremendous responsibility. They are all embarking on what will be one of the most important years of their lives. This may be the 25th anniversary of women in Rotary International but, coincidentally, it is also the first year in the entire history of Rotary in the Comox Valley that the presidents of all four clubs will be of the female persuasion. It is a very big deal! Today, many of us take gender-rights for granted. But as Rotarians celebrate this milestone event, we must acknowledge that women’s ‘right to join Rotary’ was a decades-long effort of both men and women campaigning for gender equality worldwide. The first documented effort was in 1950, when an enactment to delete the word ‘male’ from the Standard Rotary Club Constitution was processed by a club in India. From 1950 to 1989, the RI Council considered a total of 13 proposals to allow women to join. “In 1914, when San Francisco Rotarians boarded a special train to attend the Rotary Convention being held in Houston, Texas, few wives attended Rotary events. When the train stopped in Los Angeles, the only woman aboard was the wife of Rotarian Bru Brunnier. The first official Rotary Ann Auxiliary Organization was formed in Oklahoma City in 1928 and its acceptance spread to thousands of clubs throughout the world. One of the purposes of a Rotary Ann Club was to bring the families of the members of Rotary into fellowship. Other objectives included assisting Rotarians in the execution of various club and community projects, and upholding the purposes and aims of Rotary. In 1977, the Rotary Club of Duarte, California, made the bold decision to admit women as members. This was in direct violation of the RI and the Standard Rotary Club Constitutions. Because of this violation, the club’s membership in RI was terminated in 1978. The ensuing litigation proceedings lasted years. On May 4, 1987, the US Supreme Court declared Rotary could not exclude women on the basis of gender. Even though the ‘official’ approval from RI would not come for a couple more years, women’s names soon began appearing on membership rosters almost everywhere. In 1989, the RI’s Council on Legislation officially voted in favor of admitting women as Rotary members. This was a watershed moment in the organization’s history. It is interesting to note that, although a majority vote was achieved, there were 328 votes in favor of allowing women and 117 against. Gansner recalled that when the Supreme Court decision was handed down in 1987, followed by RI’s vote in 1989, there was considerable dismay within the ranks of Rotarians locally. A few Comox Valley members actually resigned. “Looking back over the 25 years since the decision, however, much has changed and women are now welcome members of the group and have become essential to its function,” he adds. “While most of the local club expansions occurred prior to their entry, their inclusion has kept RI membership and our local clubs relatively stable, at a time when many other service clubs have had difficulty sustaining members. The Strathcona Sunrise’s Club new president, Lynn Brandon, grew up in the Comox Valley but joined her first Rotary Club while living in Prince Edward Island. She became a charter (founding) member of the Stratford Rotary Club in 2002. When she and her family moved back to Vancouver Island in 2005, finding a new Rotary Club was a top priority. An individual’s anniversary of joining a Rotary Club is always celebrated, but most Rotarians will tell you that there is usually a pivotal moment where they feel they have become a true Rotarian. Carmichael admits to being a little intimidated when she first joined Rotary but soon felt right at home. “I have worked hard to earn the respect of our members and I feel that I am not looked at as a woman but rather simply a Rotarian,” she says. Deborah Nolan was never a Rotary Ann but she has many years of experience as the spouse of a Rotarian. Her husband, Bayne Mann, has been a member of the Strathcona Sunrise Club for 24 years. In 2006, when the Cumberland Centennial Club was being formed, Nolan’s husband encouraged her to step forward as a charter member. Holly Grant also has years of familiarity as a Rotary spouse. She, along with her husband Tom and their three children, moved to the Comox Valley from Ontario 1992. Tom was soon invited to join the Comox Club. In 2006, Holly was also invited to join. “The timing was finally right for me to get involved,” explains Grant. “Our children were old enough to be on their own on Thursday nights and, considering that I had attended so many Comox Rotary Club events over the years with Tom, I knew this was the right group for me. Recent research conducted by Rotary International showed that, despite 25 years of women actively participating in the organization, the stereotype still exists that Rotary is an older gentlemen’s club. 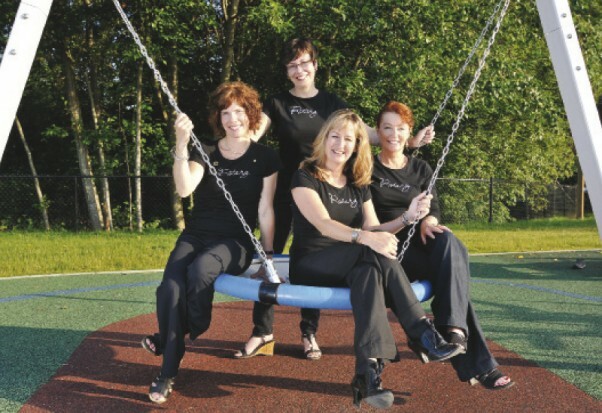 These four Comox Valley women want you to know that Rotary does have a softer side. The membership roster for any club truly represents a cross section of business people; all cultural, race, religious, age, and gender barriers have been removed. Rotary is not about men—or women—it is simply about people giving back to the community. Helen Austin is a singer/songwriter from the UK now living in the Comox Valley. She was recently asked to help celebrate the 25th anniversary of women in Rotary by writing a song about it. You can listen to the lyrics and watch the story unfold in photographs on YouTube. Type ‘Women in Rotary’ in the search engine and sing along! For more information on this talented award-winning artist, visit www.helenaustin.com. Great story and picture. Thanks to everyone. This is fabulous! You must have really worked hard to bring out this article. I am going to share it with all my fellow Rotarians in RID 3250. It is a pleasure to know that a Rotary club in India played a pivotal part in admitting women in Rotary. Congrats and thank you.